The Aston Martin vehicle brand is part of the Aston Marton Lagonda Limited luxury sports car company, which is based in England. Between 1994 and 2007, Aston Martin was owned and controlled by the Ford Motor Company, although the company was partially acquired by an investment group in 2007. Under Ford’s ownership, the company got a new production facility in 1994, ramping up the company’s output as well as marking the first time Aston Martin vehicles were mass produced. The company was further divided in 2012, when another investment group put up funds for partial ownership of the brand. Though many Aston Martin models are still produced at the company’s existing factories, Aston Martin also enlists the services of Magna Steyr, a coachbuilding company based in Austria, to produce some Aston Martin models under contract. Under previous arrangements, Ford still manufactured Aston Martin V8 and V12 engines in German facilities until 2013, at which point Aston Martin made a new agreement with Mercedes-Benz for the supply of some mechanical and engineering components. The first hint of the Aston Martin Rapide came in 2006, when Aston Martin showed the car, in concept form, at the North American International Auto Show in Detroit. The name of the model is a throwback to the Lagonda Rapide, a luxury sedan that was produced by the Lagonda brand before Lagonda was absorbed by Aston Martin. 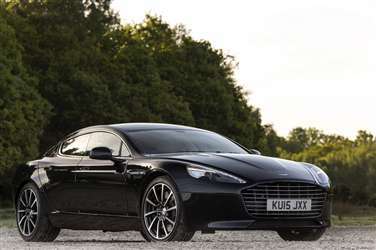 The Aston Martin Rapide marked the first time Aston Martin had designed a four-door car since the Aston Martin Lagonda ended production in 1989. Three years after Aston Martin revealed the Rapide concept, the car’s production version was shown at the Frankfurt Motor Show, and the car was released in spring of 2010. The Aston Martin Rapide was originally produced in Austria, under a contract with Magna Steyr. Sales of the Rapide fell short of expectations, though, so Aston Martin brought production to England in 2012, six years before the company had originally planned to end production at Magna Steyr. For the 2014 model year, Aston Martin replaced the Rapide with the Rapide S.
Like its predecessor, the Aston Martin Rapide S is based on the Aston Martin DB9. It is powered by a 5.9-liter V12 engine that yields 550 horsepower. Aston Martin says the Rapide S is capable of accelerating from 0-60 in 4.4 seconds, which is 0.4 second quicker than the outgoing Rapide. The Rapide S also has a faster top speed than the Rapide, clocking in at 190 miles per hour. The Aston Martin Rapide S is equipped with an adaptive damping system that offers the driver the option of normal, sport, or track settings for firmness and ride quality. The Rapide S closely resembles both the original Rapide and their ancestor, the DB9. A completely new grille design helps the car stand out somewhat, and even sets the Rapide S apart from the rest of the Aston Martin lineup. Other front end refinements to the Rapide S are subtle, and were made not for aesthetic purposes, but to meet European pedestrian safety regulations. Like most supercars, the list of standard equipment on the Rapide S is extensive, but its customization options are nearly limitless. Aston Martin will customize a Rapide S to suit a buyer’s dreams and wallet. Shortly after the car’s European release, it was available for export to North America.